... two climbers were bushwhacking out of the Pickets and got separated in the green hell of the descent. The first climber stumbled out onto the Big Beaver trail and waited half of a day for his buddy. At long last he was spotted, stumbling packless out of the brush. "Hey, where the F^&% is your pack?" "F&^* that stuff (tent, rope, ice ax, crampons ...)," he replied. "I ditched it!" Needless to say, I don't think my partner enjoyed the Pickets. The following page details this infamous "picketed in the Pickets" adventure. But at least I got to climb Mt. Challenger! Left: Mt Challenger from Challenger Arm. Right: Northern Pickets from our camp on Challenger Arm. Jump to PLAN • The PLAN of the trip. Jump to SUMMARY • The SUMMARY of the epic adventure. 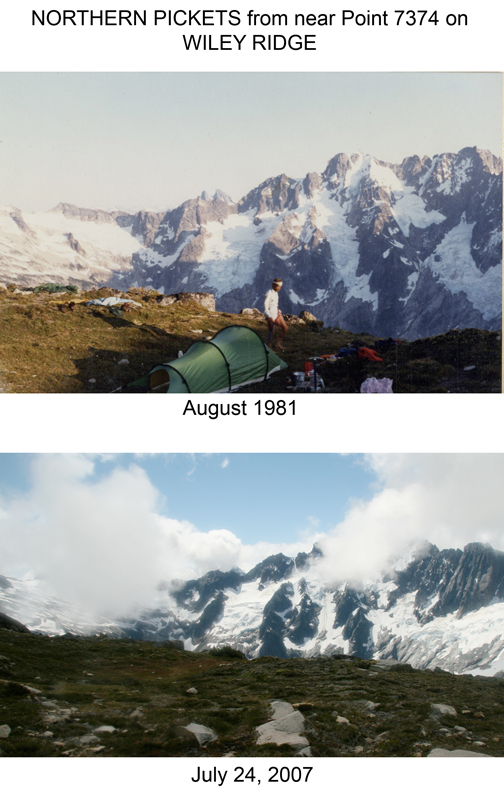 Jump to PARENTS • Photos from my PARENTS’ TRAVERSE OF THE NORTHERN PICKETS IN 1981. Jump to TRAVERSE • A successful NORTH TO SOUTH TRAVERSE in August 2008. This was my first climbing-oriented trip into the Pickets, which boasts some of the most rugged and most beautiful terrain in the Lower 48. My grand plan was to do a complete traverse from north to south, beginning by hiking up Big Beaver Creek and shwacking up Wiley Ridge, then climbing Challenger and Fury, crossing over into the Southern Pickets via Picket Pass, and then climbing Terror and a few other peaks before heading out via the brushy Goodell Creek. I planned on 10 days, although Michael Stanton et al had done a similar traverse in 7 days in August 2004 (he has a great trip report posted at http://www.mountainwerks.org/cma/2004/pickets/index.html). The Pickets are no ordinary backpack trip, and I was fully aware and prepared for the physical and mental challenges involved. Ed Hobbick responded to my post on Cascade Climbers.com. We made plans to do the trip in late July. We began the ambitious adventure on July 22. Unfortunately, the trip did not go exactly as planned. Here is a map showing the planned traverse (in blue) and the actual route we took (in red). The following page details our adventure, including a description of a successful climb of Mt. Challenger. Of course, there are several photos. At the bottom of the page I have compared some of my photos from this trip with some photos my parents took during their traverse of the Northern Pickets in 1981. The trip started off great. We strategically hiked the first two days in the rain, but had a solid forecast of sun for the rest of the trip. The approach to Challenger up Wiley Ridge was straightforward and offered some enticing views of the Northern Pickets. The climb of Challenger was a blast. Our campsite on Challenger Arm overlooking Luna Basin was gorgeous. I gazed upon our planned route through the Northern Pickets, and anticipated a view of the Southern Pickets hiding behind the ridge. Overlooking the Luna Cirque – with the thundering of calving glaciers and with the rugged peaks towering above – one is treated to a full appreciation of the ruggedness and challenge of the Pickets. I think it was at this point that Ed realized that the planned traverse was a bit too ambitious for his tastes. I was incredibly disappointed at this unexpected turn, but realized that the Pickets are not somewhere you want to be if you are feeling out of your comfort zone. So we pulled out the maps and looked for a line of retreat. Neither one of us wanted to reverse the route along Wiley Ridge since, although straightforward and familiar, backtracking is, well, not exciting. I suggested following the route over to Luna-McMillan arm and taking Access Creek back to the Big Beaver trail. I liked the idea of getting a view of the Southern Pickets before heading out, and possibly scrambling up Luna and Fury via less technical routes. Ed voted for exiting via Luna Creek, which would bring us back to the Big Beaver Trail in only 3 miles. Looking at the map, I saw that Luna Creek is the shortest and flattest way into the Northern Pickets from the Big Beaver Trail, and briefly mused on why it is not a standard approach route. Perhaps I should have mused upon this point longer. So down Luna Creek we headed. After the worst imaginable struggle with flies, devil's club, willows, and alder on the bottom of the valley flood plain, exhausted by a 3-mile struggle against bush, logs, and marsh, we arrived at the Big Beaver trail around 1:30. Our only remaining food was oatmeal and orange concentrate. We ate the oatmeal dry, without sugar. Ed and I have joined the small handful of climbers who have experienced Luna Creek. It was certainly a character building experience. Ed and I ended up getting separated by the wall of brush. While I made it to the trail that evening, Ed spent the night in the jungle, and ended up ditching his pack and meeting up with me the next morning. 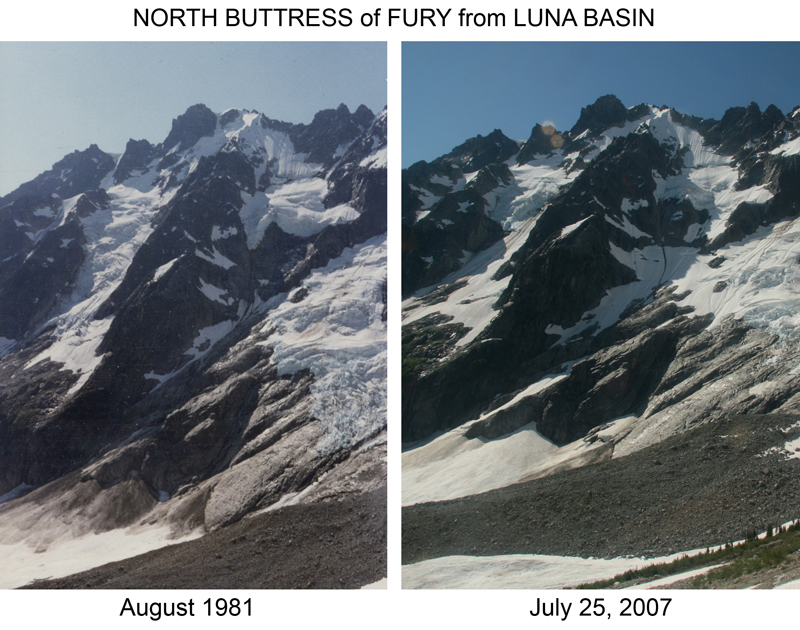 Needless to say, I don’t think I’ll consider Luna Creek as an approach route for the north buttress of Fury. Overall, I was quite disappointed that the grand Pickets traverse I had planned did not work out as planned. However, Ed and I both came out in one piece with some good stories to tell, I got some good photos and made a successful climb of Mt. Challenger. Scroll down for some photos and more detailed commentary, as well as a description of my solo climb of Mt. Challenger. 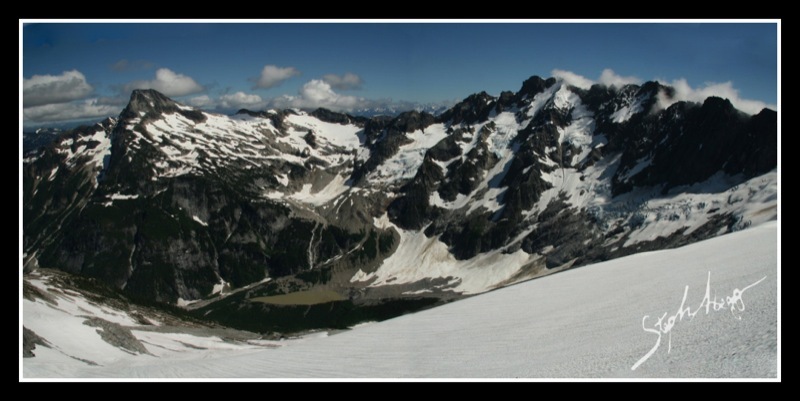 There are a few options for approaching the Northern Pickets (the popular approaches are Easy Ridge to Perfect Pass, Whatcom Pass and over Whatcom Glacier, or Big Beaver Creek trail to Wiley Ridge). For this trip, we started at the Big Beaver trail, where a water-taxi ($35) on Ross Lake cuts off 6 miles of the approach. From where the boat drops you off it is 14 miles along an easy trail to Big Beaver Pass. Dock at the Big Beaver Trailhead after getting our water taxi ride. There is a regular campground here. We slept in the shelter near Big Beaver Pass. We had gotten thoroughly soaked from the drizzle and wet foliage, so it was nice to have room to lie out all of our wet stuff. 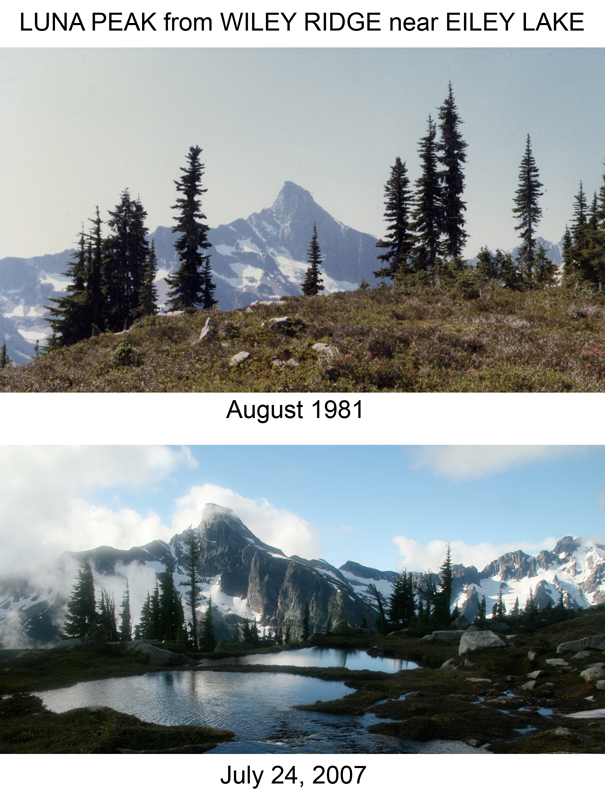 To get onto Wiley Ridge, you have to ascend about 2000 vertical feet of timbered slope from Big Beaver Pass. As far as bushwhacking goes, it is not too bad. We got thoroughly soaked from the drizzle and wet foliage. Looking up Wiley Ridge just after we broke out of the trees. It was raining pretty heavily, but we were not too worried since we had a good forecast ahead. We traversed along the south side of the ridge crest for awhile and then along the south side of the ridge along a faint trail until we got to Eiley Lake. We woke up to clouds giving way to sunbreaks and views of the Northern Pickets. Our campsite at Eiley Lake was quite scenic now that we could see it. The good weather had arrived! Another photo of our beautiful camp at Eiley Lake, with Luna dominating the view across the Luna Creek drainage. It is a pretty straightforward traverse along Wiley Ridge toward Mt. Challenger. This photo is taken looking towards the Luna Basin cirque. Looking toward a final snowfield on Wiley Ridge leading up to Pt. 7374 on the right. Mt. Challenger is peaking above the snow on the left. We descended a snowfield on the south side of Pt. 7374 to get down to Challenger Arm. The description in the Beckey guide suggests taking a snowfield around the north side of Pt. 7374, but the route we took was pretty straightforward, although further melting might make getting down to the snowfield a bit trickier (we had to downclimb some Class 3/4 rock to get onto the snow). Our campsite was on the knoll on the lower Challenger Arm in the photo. We had a pretty amazing camp on the lower Challenger Arm around 5900ft. The camp overlooked Luna Basin and gave intimidating and grand views of the surrounding Northern Pickets. The north buttress of Fury cut an amazing line from the basin to the ridge crest. But to my disappointment, this view of the Pickets proved to be too much for Ed, who decided he would rather head out, and started to look for the quickest line of retreat. Luna Creek was the shortest way out….. Looking down into Luna Basin from Challenger Arm. 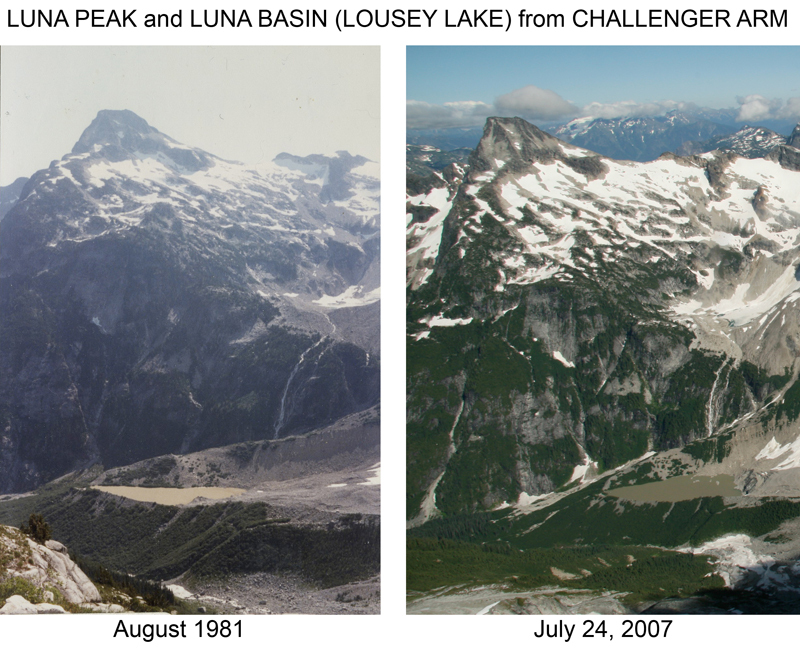 Luna Peak is on the left, Fury is on the right. The Southern Pickets are in the distance. We left out stuff at camp and began a 2300ft climb up Mt. Challenger. The climb up Challenger Arm is all snow until the final rock pitch to the summit. There was a giant bergschrund that prevented easy travel to the summit, so Ed decided to head back to camp, and I weaved around a couple of crevasses on exposed, steep snow. This photo shows part of the giant bergschrund that cuts through the mountain and prevents easy access to the summit ridge. As the photo shows, there was a small snowbridge, but it looked pretty thin and tricky above the yawning cavern below. I could not safely cross here, so I backtracked a bit and weaved around some crevasses nearer to the ridge (shown in the next photo). This photo shows the crevasses I had to weave around to get onto the summit ridge. These crevasses were pretty large notice Ed in the center of the photo, looking down into the crevasse just before he decided to turn around. Depending on how the snow melts, and the topography of the rock below the snow, it is possible the route I took will not be possible by late summer. 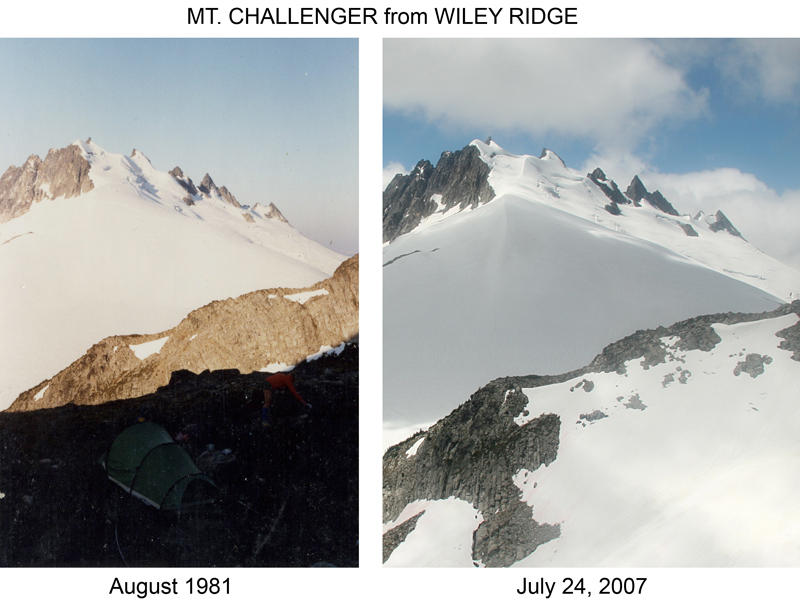 The final snow ridge to the rocky summit (the summit of Challenger is the peak on the right). The climb of Challenger finishes with a 50ft rock pitch (Class 5.5). I secured myself by clipping slings to the 4 fixed pitons. The exposure was great! My summit photo, with the Northern Pickets extending off to the south. The Southern Pickets are obscured by clouds. Evening light on Challenger Glacier during the descent back to our camp on the lower Challenger Arm. I bootied a pink tricam and biner from Challenger. Mt. Fury in sunset colors from camp. Moonset over Mt. Fury from camp. I slept outside so I could get some night photos. Starry night in the Northern Pickets. The good weather system had arrived. Tent and Milky Way. Morning clouds in Luna Basin. Luna Peak on left, Mt. Fury on right. Morning reflection of the Northern Pickets in a small pond near camp. Fury on left, Swiss Peak on right. On the traverse from Challenger Arm into Luna Basin it is best to stay high until you come to an obvious snowfield down (as shown by the line drawn in the photo). We made the mistake of dropping too quickly and got caught in some cliffs. Ed descending some cliffs we got caught in since we started descending too soon. A bear in Luna Basin near the head of Luna Creek. Ed started heading down while I ate lunch and collected some of the cubical chunks of iron pyrite in the talus fields before I too began the epic shwack down Luna Creek. In retrospect, we should not have separated at this point because thick foliage and miscommunication prevented us from being able to meet up until Big Beaver trail the next day. Looking down Luna Creek from Luna Basin. 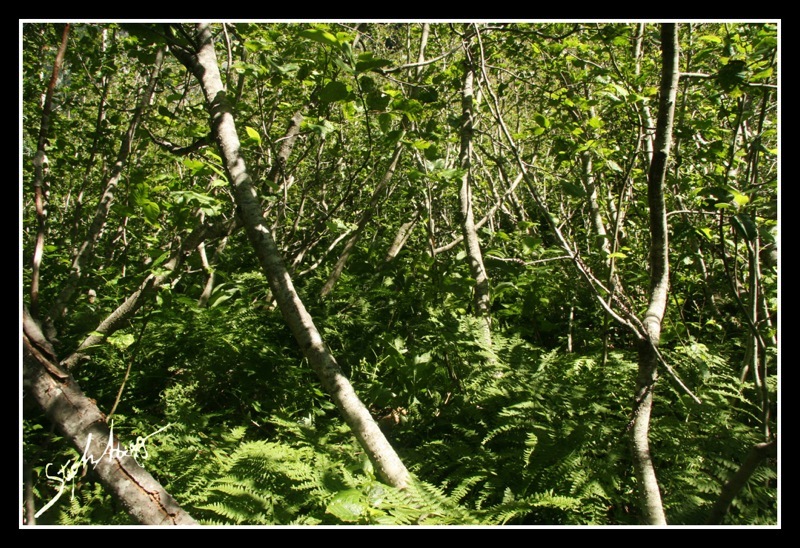 The flat valley floor and rich glacial floodplain soil is a perfect habitat for a nasty concoction of huckleberry, Devil’s Club, vine maple, and slide alder. And the bugs were bad too! Getting through this (with a heavy pack to boot) was no easy task. And did I mention the bugs were bad? At times, it was easiest to just ford the creek. However, the water got too deep and fast as we made our way downstream, making thrashing through the bushes the only option. It felt like I had been bushwhacking forever, but at a rare break in the foliage, I was disappointed to see how close I still was to Luna Basin. I took this photo shortly after I had caught up with Ed. The foliage was so thick we could not even see each other. I waited here for him for awhile but we never were able to successfully meet up until the next day. This caliber of bushwhacking is stressful enough, and having to do it alone was not something either one of us wanted to do. And more bushes….crawling was sometimes the only option. I averaged 0.5 miles an hour and got to the Big Beaver trail at 7:20pm. Ed was stuck overnight in Luna Creek, ended up ditching his pack, and met me on the trail the next morning. I had spent a sleepless night worrying about Ed and imagining him injured or hopelessly stuck in Luna Creek bushes, and I was so glad to see him appear on the trail at 7:30am. His pack will probably be a moss-covered blob in a couple of years time…. At the trip’s end at the dock at the Big Beaver trailhead. We found a ranger who as able to arrange a water taxi for us. 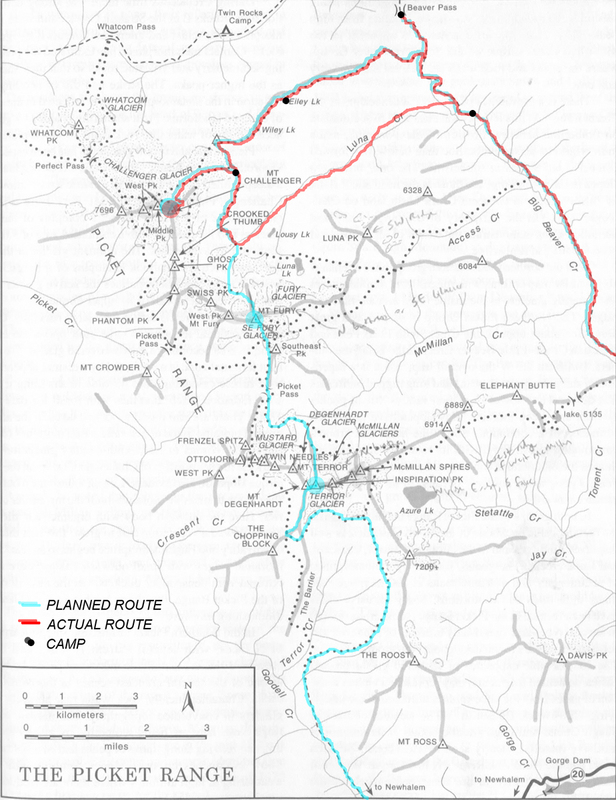 Twenty-six years ago (2 years before I was born), my parents did a traverse of the Northern Pickets. They hiked up Access Creek to the Luna-McMillan Arm, climbed Luna and Fury, descended down into Luna Basin and then up the other side to the Challenger Arm, climbed Challenger, and then hiked out via Wiley Ridge. It is interesting to compare some of the photos I took with the photos they took during their trip in 1981. August 2007 A second attempt and another Picketed partner. August 2008 Third time is a charm! A trip of a lifetime.